As you see, VFaL was quieter this week with off line chores, deadlines, and catching up with friends and family before turning on after burners into April. A day off turned into a Spring Break. Now with the news that Rich will be scaling back for a variety of reasons, including Stephen stepping down from the site, there will be a void in the 3BN. Reading Angelenic's insightful development MoJo, powered by younger legs, had me need to catch my breath from running between here and blogdowntown. Needless to say; Job well done, gentlemen. THAT IS A LOT OF BLUE: 115,300 Angelenos wanting to be part of a I-was-there kind of night crammed into the Los Angeles Memorial Coliseum to watch the Dodgers fall to the Red Sox. Baseball fans will be talking about the outdoor party that welcomed in spring for a long time. So will cab drivers. They made a killing transporting fans who got fed up waiting in line at Dodger Stadium for the McCourt shuttle service. Someone finds a way to park bikes at a sporting event. On the historic grounds where the city began, so do the budget cuts. 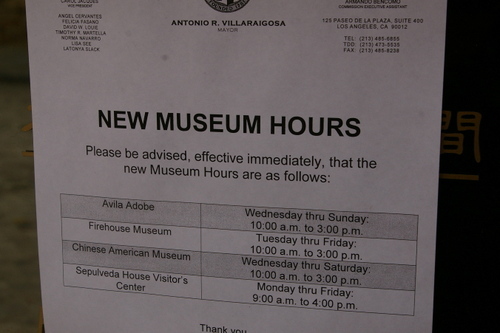 In response to city’s shortfall, El Pueblo’s museum hours and part-time city employed museum guides are among the first to go. 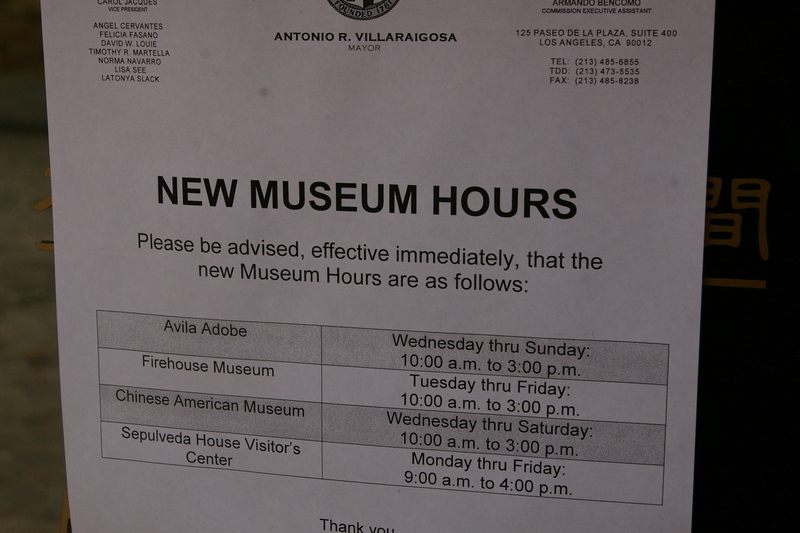 Up to 10 part time employees were laid off late Friday afternoon, and smaller museums will go dark during the early part of the week. Originally uploaded by view from a loft. 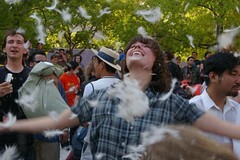 Pershing Square was the Los Angeles site for International Pillow Fight Day. Attended by over 150 people, a number of observers, and a few befuddled security guards, witnesses reports seeing people on the Red Line armed with pillows to join those who convened at the Downtown park. As of this time, no pillow is known to have survived. After Mahony the Cardinal made an entrance from Olvera Street, he offered a blessing. Then there were a few speeches; from the Tony the Mayor and a flock of council members named Jose, Tom, and Wendy. 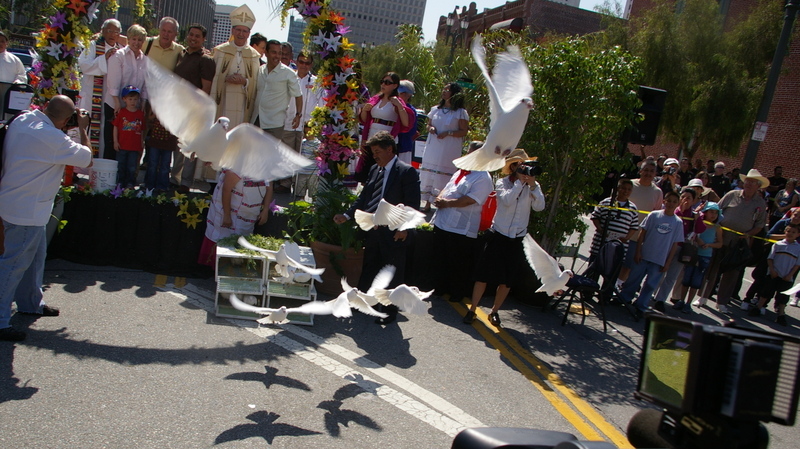 Then doves were released to welcome guests like Cokie the Box Turtle, Juan Diego the Dog, Oscar the Cat, Richardo the Parrot, and Ventura the Snake to the 78th Annual Blessing of the Animals. BlogDowntown + Photos. Also in tu ciudad is a story of Alma Martinez, an assistant professor of Theater and Dance at Pomona College who was in the original cast of Zoot Suit. She is remounting and directing the same musical April 3-13 at Pomona College to mark it’s 30th anniversary. 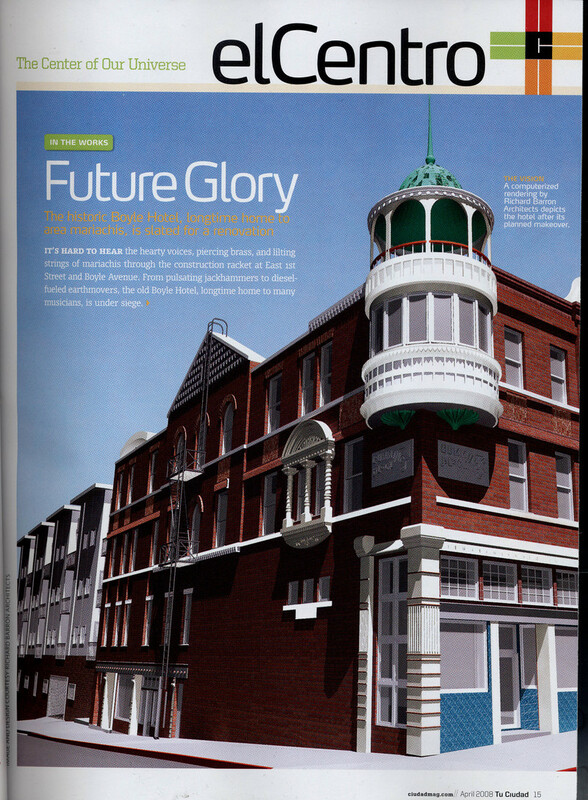 It will be complete with panel discussions and exhibitions. Good idea? I think so. With all the talk about DASH fares and the interest in how Central City East will be served by a new DASH line, it’s interesting to see the new proposed route as posted by Don Garza last night. 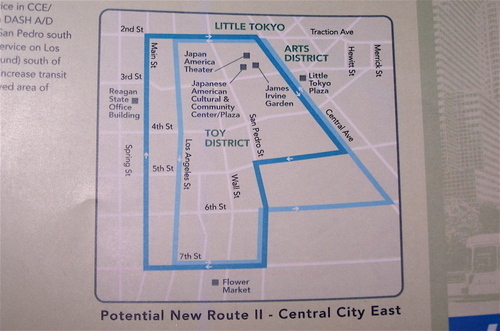 Come late summer, there will be more public transportation to Central City East’s Fashion and Flower Districts via Central and Skid Row, with a northbound route up Main St, and a southbound route down Los Angeles Street. The new line's name is tentatively DASH G, as it follows the already named DASH A, B, C, D, E and F.
The line should remain DASH G––G standing for Garza. Possible tagline: "Ride the Garza to Gilville." 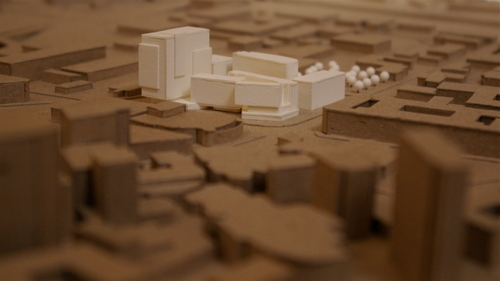 Now, what's with "Arts District" straddling Alameda on the map? Some of the older residents of Boyle Heights are critical of “illegal” vendors and unleashed dogs seen in this piece. LAPD isn’t too fond of an image of a man with his hands raised next to a taco truck with a patrol officer standing near by. 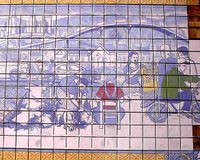 Is it a another graph mural waiting to be white washed mysteriously? Not this time. 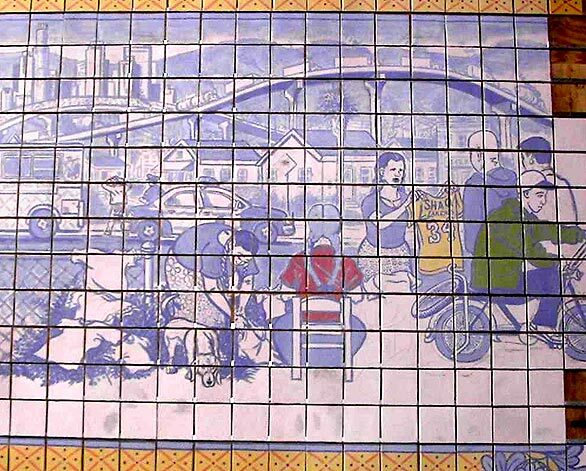 The Times reports on the Boyle Heights community reaction to the $195,000 100-foot tile mural for LAPD’s new Hollenbeck station by artist Sandow Birk . The local monopoly known as Homeboy Industries has Downtown rooting them to fulfill their mission statement to empower lives of former gang members. In the last five months, Homegirl Café has brought in more than $220,000, and in the last three months Homeboy Maintenance takes in $6,000 a month. Also in 90 days, Homeboy retail store sold $25,000 in Homeboy wear, as reported by the NYTimes . . .the business section, thank you very much. The organization is also anticipating expansion. The new Homeboy headquarters, a few blocks from Los Angeles City Hall, “gives us a chance to reach out to African-American gangs; our focus is countywide,” Father Boyle said. "Mangrove" site as seen from Gilville. • Heard on the Blue Line near Staples Center: "Next stop is the Pico / Chick Hearn." Call it the no harm, no foul, route. • Man One keeps on keeping on. He's been invited to speak at the Getty April 17 in a panel discussion on The Arts in Los Angeles. He writes "Led by Patt Morrison this should be a lively discussion. I'll try and wear my best hat!" 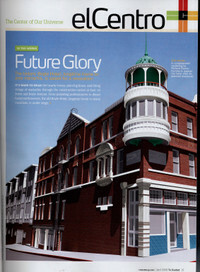 Also, Man One appears in this month's Tu ciudad.